On September 21, 2010, Force Construction, a Columbus, Indiana contractor was given the Notice to Proceed for the Design/Build of Twin Bridges Carrying I-69 over the East Fork White River by the Indiana Department of Transportation (INDOT). 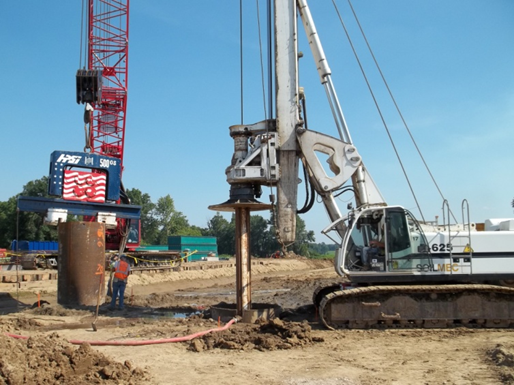 Hayes Drilling, Inc. was contracted by Force Construction to install a total of thirty-two (32) drilled shafts. 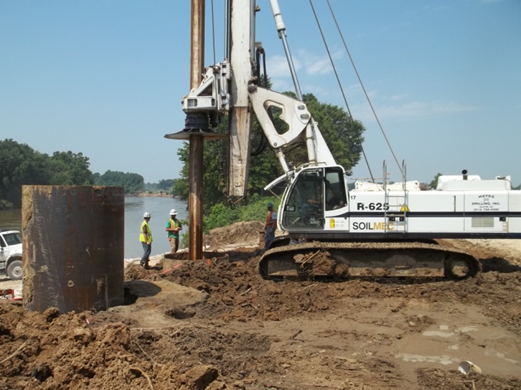 The project consisted of two (2) each – 9 span bridges, with a total of 8 bridge piers per structure being supported on 66” permanently cased drilled shafts with a 60” rock socket. Casing lengths ranged from 101’ to 122’. Drilled shaft installation began in July, 2011 with the mobilization of a Soilmec 625 drill rig along with support equipment, including a model HPSI 500 Vibratory Hammer. Permanent casing for each drilled shaft was delivered in two (2) pieces and spliced vertically, with the bottom 75’ piece of casing already in the ground. The remaining casing was then vibrated in place to bedrock. Each shaft had a minimum five (5) foot rock socket. Over 3,500 cubic yards of concrete was placed for the construction of the drilled shafts. Through tremendous cooperation with Force Contracting and INDOT, the project was successfully completed in November, 2011.